UNISA applications for Term 1 2018 are now closed. Did you get your UNISA application in on time? Now you need to wait to hear if you got in. If you need to know how to check the status of your application please read here: http://togetherwepass.co.za/unisa-application-status/. Remember if you are accepted you MUST register for the first term in 2018 or you will have to apply all over again. Did you miss the application period? You will need to wait for the next application period, which will allow you to start studying in June 2018 if you are successful. The dates when you can apply are from the 16th to the 23rd of April 2018! There is only one week given for the term 2 applications, and not all qualifications are available to apply for. UNISA has stated that many of the qualifications are already fully subscribed to, and do not have space to add further students in semester 2. 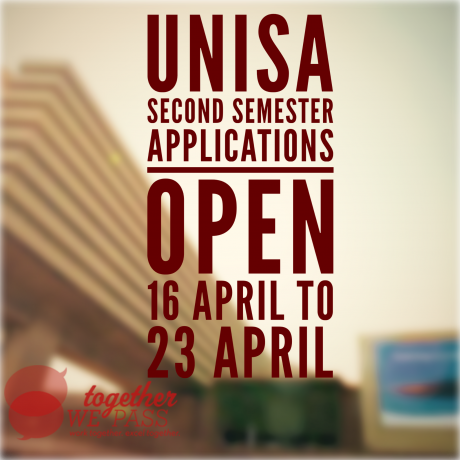 So apply early to see if you can get one of the few spaces left available at UNISA! Want to start studying now? If you are not happy to wait until June 2018 to start your studying why not consider studying with a different institution? There are many other distance learning institutions that can also let you work and study at the same time. Why not consider one of the private distance learning colleges instead of UNISA? If you study a qualification such as CIMA (an internationally accredited Management Accounting qualification) or ICB (locally accredited diploma qualifications in business management, financial accounting, office administration, entrepreneurship and public sector accounting) you will get your first qualification after only 3 or 4 subjects! This is very different to UNISA. At UNISA you need to do 42 subjects before you get your qualification, which takes around 10 years for students who work and study at the same time. Imagine – you could have your first certificate level qualification in 1 year, so that you can start to find a job and get experience in your industry immediately. By the time you have your full qualification in 3 years time you will have the qualification and experience working in your industry. This is vital to getting a great job in your chosen career. Please keep reading if you are interested in alternative qualifications that you can study at a private distance learning college like Skills Academy. If you want to be an accountant you cannot do better than CIMA. These are a professional qualification, which means that it is specifically aimed at teaching the skills and knowledge that are required by the industry. A CIMA qualification is on the same academic level as a University degree, and for many employers it is seen as better than a degree which is very theoretical. If you want to know more about CIMA please fill in this form and you will get a call from our sister company Skills Academy who can explain the CIMA qualification in depth: http://togetherwepass.co.za/cima-form/. If you are not interested in management accounting then perhaps one of the ICB qualifications will be more interesting. Remember these qualifications are not on the same level as a university degree, and only take around 3 years to complete if you are studying and working at the same time. For an ICB diploma course you only need to complete 12 subjects, rather than the 42 you need for a university degree. There are exams 4 times a year, so you can easily complete the full diploma in 3 years. Also remember that the diploma qualifications are made up of 3 or 4 qualifications. So you will get your first qualification after the first 3 or 4 subjects, depending on what stream you take. Once you get your National Certificate in Bookkeeping you can start looking for work! After just 1 year, instead of waiting 10 years! With this qualification you could get a job with the following job titles: Junior Bookkeeper, Accounts Clerk, Reconciliation Clerk, Payroll Clerk, Accounts Payable/Receivable Clerk. 2 Responses on UNISA applications for Term 1 2018 are now closed"
Unfortunately we only offer online study groups , you will have to contact UNISA directly for registration or visit their website for more information.